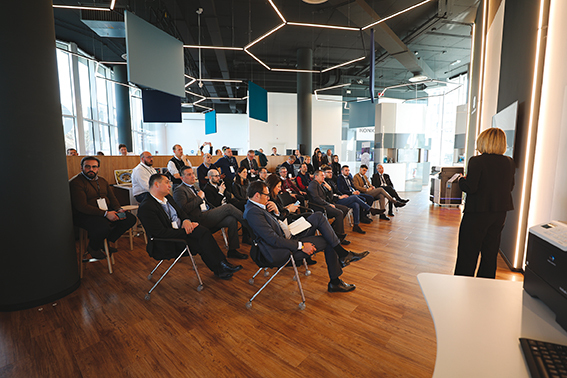 Konica Minolta showroom, a stone’s throw from the center of Milan, and already fully operational at the end of November, is a space dedicated to the technologies and innovations of the present with a look at the future and the trends to follow. In the “Digital Image Square” there is the best that Konica Minolta technology can offer the market for every type of solution: from office to commercial printing, from labels to packaging, to finishing technologies, all supervised and controlled by a series of cameras, a recent application added to Konica’s product portfolio, thanks to a strategic acquisition and linked to the world of security, but which can also be applied in the retail and large-scale retail sector and consequently have consequences on packaging, thanks to the infrared thermal detection technologies and the study of buyers’ behavior at the point of sale. The supermarket is the ultimate arena where label finds its natural habitat on every type of product and packaging. 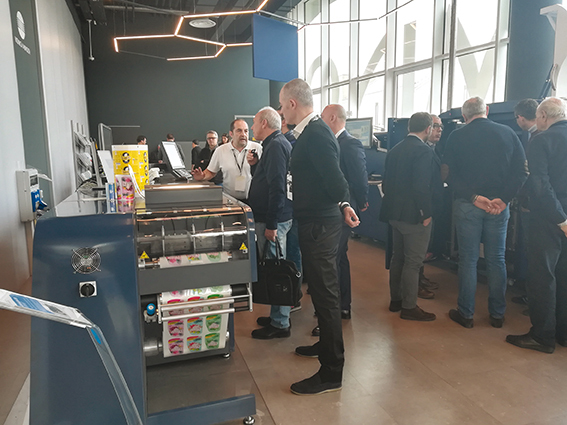 And one of the two focuses of the day conceived by Konica Minolta to present not only its own technologies, but also to provide some interesting market insights, has seen label world as a protagonist. 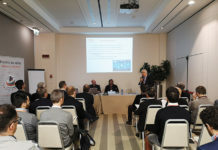 Elisabetta Brambilla, entrepreneur in the label sector as well as President of Gipea has in fact presented the data of a growing and very interesting sector from different points of view. 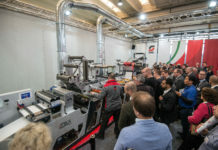 With a turnover of 720 million euros, Italy ranks fourth in the European ranking of self-adhesive paper label manufacturers, preceded by France, Great Britain and Germany. From 2016/2017 Finat data on the European market, the state of a decidedly healthy sector emerges clearly, especially when compared to other sectors, with sales for the Southern European area in which we are located, attesting to 7.3%, decreasing if compared to 2016 where was reached 8.1%. 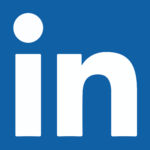 Food, beverages and pharmaceutical industry are the main sectors in which growth is evident. 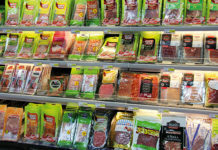 At the Italian level, the production and consumption of self-adhesive labels is up 6%, like for exports, which average is 16% of production. “Export rewards the creativity of Italian companies, able to present themselves on the market with beautiful and attractive solutions, highly appreciated by customers in other countries”, says Elisabetta Brambilla. 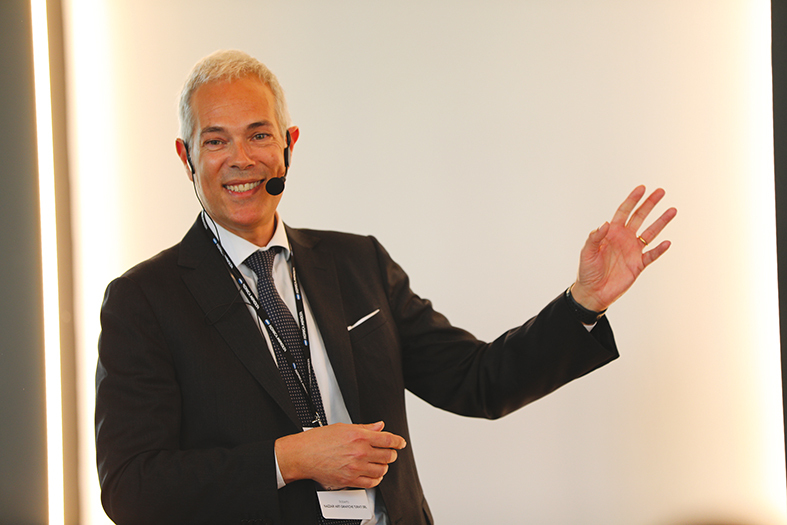 Still analyzing Finat data, there are around 2300 digital printing machines operating in Europe today, 71% of which use toner technology while the remaining 29% are inkjet/hybrid technology. Toner machines arrived first on the digital label printing market, gaining an important market share. Analyzing 2017 installations you can note that inkjet/hybrid systems have grown to 59% while those with toner stand at 41%. 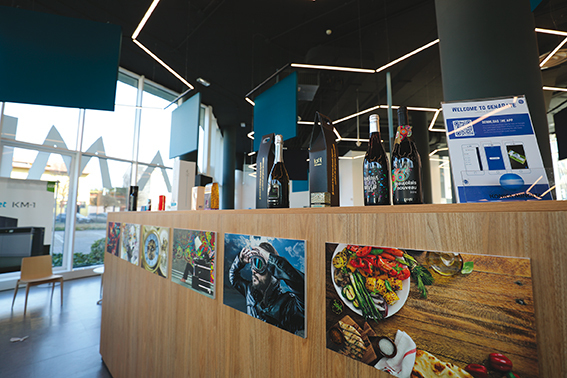 Present in the showroom, AccurioLabel 190 is Konica Minolta proposal for web digital printing of self-adhesive labels, on all the most common types of substrates, with speeds of 19 meters per minute. 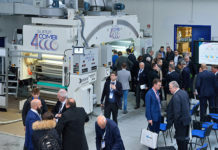 AccurioLabel 190 is positioned in the mid-range, between the entry-level machines and the top of the range, capable of guaranteeing quality and productivity at a low cost, a not negligible element for those approaching a new market for the first time. The machine prints at a resolution of 1200×1200 dpi on web with a maximum width of 330 mm and is equipped with the innovative IC-602 color control system as well as a BST web guiding system on the rewinder and a belt cleaning system. 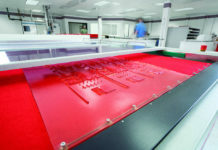 AccurioLabel 190 can also be equipped with a certified finishing module. 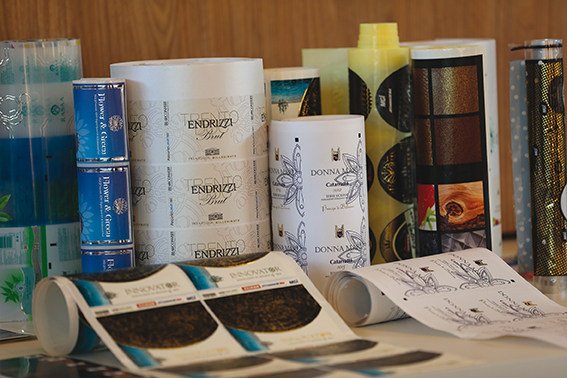 As regards finishing of web printed labels, Konica Minolta proposes the JETvarnish 3D Web by MGI (a company partially owned by Konica Minolta), which allows to carry out finishing like in-line spot varnishing, hot-foil, die-cutting and cutting. 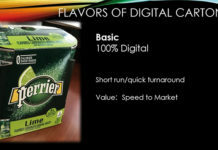 This machine finds application both in the field of labels and flexible packaging. The second intervention of the workshop was held by Roberto Nazzari, owner and commercial manager at Arti Grafiche Turati, a company founded in the mid-80s, but which has its roots in the 60s, inheriting the history and know-how of Turati- Lombardi, a historic company in the graphic arts scene in Italy, specialized in security printing. Arti Grafiche Turati thus begins a new path in the field of continuous forms printing, with a constant growth year after year. 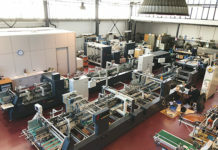 “The work was going well, but fortunately our desire to keep growing pushed us to offer our historical customers of continuous forms also other types of printed matter”, says Nazzari, “therefore we started to collect printing orders in general, that we realized with external printers, up to the point when the amount of work was so important, that we took into consideration to equip ourselves with new equipment to supply our customers directly. So, we installed the first printing presses, inhouse prepress and bindery, the path we took allowed us not to feel the disappearance of the continuous forms from the market because in the meantime we had changed our business. No collaborator was fired, and this is something that still fills me with pride. 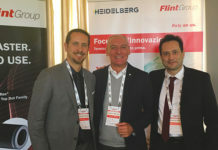 With the same spirit, over the years, we first added digital printing and just recently the finishing with MGI JETvarnish 3DS for digital finishing of materials printed with offset and digital printing in B1 format”, says Nazzari. 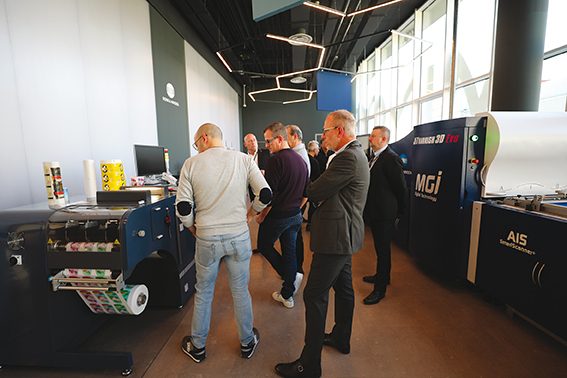 Today, to spread the potential of the new equipment available at Arti Grafiche Turati, the sales team offers customers a normally printed proof of job and a second finished proof. The results are under everyone’s eyes and the growth of finishing department of the company bears witness to this. “If you explain to the customer you get an effect, but to let him touch his printed material with a series of beautiful finishing effects that can enhance the communication of our customers with a minimum cost variation is really another story”, concludes Nazzari showing us their corporate brochure, a small piece of art printed and finished in digital!